The Panasonic TX-L42E6B’s first attraction is its price: £800 (around US$1,227 / AU$1,182) isn’t bad at all for a 42-inch LED TV from a big-name brand. Making the price look even more attractive, moreover, is the Panasonic TX-L42E6B’s design. Because, impressively, Panasonic has managed to extend the gorgeous super-slim ‘metal and glass’ design concept introduced on its flagship models in 2012 down to the lower to mid-range E6 series for 2013. The Panasonic TX-L42E6B’s relative affordability also hasn’t stopped it benefitting from another key 2013 Panasonic attraction: the brand’s My Home Screen interface. This does a brilliant job via a series of different jumping off screens of simplifying and personalising the way you access all the different types of content – online, multimedia, TV, apps – the TV makes available. The TV uses edge LED lighting, though unlike the Panasonic DT65 and Panasonic WT65 TVs higher up Panasonic’s range, there’s no local dimming. It also provides a 100Hz engine to hopefully keep a lid on LCD’s traditional motion clarity shortcomings. The main feature sacrifice you have to make if you fancy a Panasonic TX-L42E6B is 3D; if you want to take your viewing into the third dimension you’ll have to step up to Panasonic’s ET60 series. With TVs from other brands’ 2013 ranges still very thin on the ground, currently the closest rivals are the Samsung UE40ES6800 (which is slightly smaller but adds active 3D), and the LG 42LM760T (which also adds 3D, but of the passive variety). For now, though, let’s get on with finding out if the Panasonic TX-L42E6B is really the good value proposition it sounds on paper. For a TV that sits just below the mid-point of a brand’s TV range, the Panasonic TX-L42E6B is surprisingly good looking. 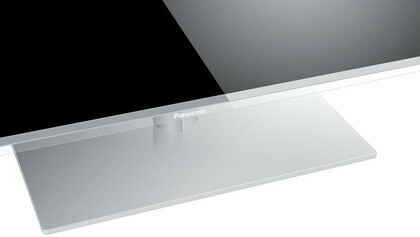 This is because Panasonic has stretched the ultra-slender look of its Metal and Glass design concept much further down its TV range than before, so that the Panasonic TX-L42E6B’s screen sits prettily within a seriously attractive silver frame that’s barely 1cm/0.4 inches across, offset along the bottom by an equally fetching transparent trim containing the Panasonic logo. As well as being attractive, the Panasonic TX-L42E6B’s slim design means it can fit into a much smaller space than typical 42-inch TVs. Turning to the connections on the Panasonic TX-L42E6B’s also slender rear, highlights include three HDMIs, two USBs, a LAN port and built-in Wi-Fi. Obviously a fourth HDMI port would have been great, as would a third USB and, perhaps, the SD card slot sported by higher-level Panasonic TVs. Overall, though, for a lower mid-range TV connectivity is perfectly respectable. There are some clues to the TV’s features in these connections, too. For instance, the HDMIs are v1.3 in focus, meaning that they’re not configured to handle 3D. This will immediately write the Panasonic TX-L42E6B off for you if you’re a 3D fan. But then it would seem most people aren’t. The USB ports show that the TV is ready to handle video, photo and music files stored on USB drives, while the LAN/Wi-Fi options indicate the Panasonic TX-L42E6B’s willingness to stream the same sorts of files from networked DLNA PCs. Plus, of course, the network options can be used to get the TV online, with Panasonic’s Viera Connect platform. More on this in a moment, but first we must talk about the new My Home Screen interface Panasonic has introduced to help you handle all the content sources just described – along with a built-in Freeview HD tuner. This interface introduces a series of different themed home screens, each delivering direct icon access to a different selection of content. You can switch at will between these different home screens, and choose which one you want as your default. Even better, you can create your very own home screen, populated only by the exact content/app links you want direct access to. Since you can establish multiple new, user-generated home screens, moreover, it’s possible for different members of your family to set up their own personalized home screens. Panasonic’s My Home Screen system doesn’t offer any of the learning features sported by Samsung’s latest smart TV interface. But it’s a much friendlier, less inscrutable system to use, even offering a straightforward tutorial when you first fire the TV up. It works quickly and slickly, too, and overall does a great job of both aiding content navigation and bringing your attention to all the content streams available to you. Panasonic’s Viera Connect online platform is robust and well organized, especially now it has improved the layout of its main apps home screen, shrinking the icons down so that you can see far more options on a single screen than you could with previous Viera Connect generations. The only catch with Viera Connect is that it still lags behind some rival online systems when it comes to the number of apps and, especially, video platforms it carries. In particular, at the time of writing there’s no Blinkbox, ITV Player, 4OD or Lovefilm support, leaving you with BBC iPlayer, Netflix and Acetrax as your main online video providers. Turning next to the Panasonic TX-L42E6B’s screen technology, it uses edge LED lighting, without any local dimming technology of the sort sported by the DT65 and WT65 models further up Panasonic’s new LCD TV range. It’s also a 100Hz model, offering a degree of motion clarity enhancement but falling short of the pseudo-600Hz system found on the step-up ET60. One other significant point about the Panasonic TX-L42E6B’s design is that it uses a VA-type panel rather than the IPS panels used in Panasonic’s 3D-capable televisions. This means that it doesn’t enjoy as wide a practical viewing angle as its more expensive siblings – though it also gives the Panasonic TX-L42E6B an advantage in another area, as will become apparent in the Performance section of this review. 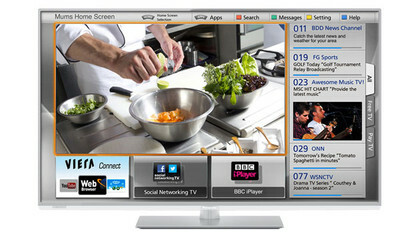 The last elements of the Panasonic TX-L42E6B’s features come from its on-screen menus. The TV doesn’t provide the full roster of colour, white balance and motion control adjustments you get with Panasonic’s higher end models, but it does still offer a passable degree of control over how pictures appear. It’s a particular relief to find a backlight adjustment – something that was conspicuously absent from last year’s Panasonic LCD TVs. Right from the start the Panasonic TX-L42E6B sets a winning tone with its pictures, delivering a level of dynamism and engaging naturalism that’s pretty rare for a mid-range TV. The main reason for this is its black level response. The TV is able to deliver dark scenes with markedly less of the ‘greying over’ problem still pretty common on all but the most expensive LCD TVs. This enables it to deliver such scenes with much more instant authenticity. Good black levels tend to be associated with good colour palettes too, and so it proves with the Panasonic TX-L42E6B. Even during dark scenes, colours – after a little tweaking via the available colour toolset – manage to combine impressively natural tones with good levels of blend subtlety and plenty of the rich, vibrant saturations that have become LED’s trademark. To get the richest black level response you do have to sacrifice brightness – or rather, backlight – from the image. This can lead to a little shadow detail in the very darkest parts of the picture falling by the wayside. But this is hardly a rare phenomenon in the LCD TV world, and in fact the amount of shadow detail lost in the effort to produce a convincing black colour isn’t heavy at all by mid-range LCD standards. Watching scenes that combine predominantly dark images with some very bright elements – such as the opening black and white scenes of the modern Casino Royale – reveal another strength of the Panasonic TX-L42E6B’s contrast performance: good backlight uniformity. In other words, dark scenes largely avoid the blobs of extra light that pollute the rendering of dark scenes on so many edge LED TVs. 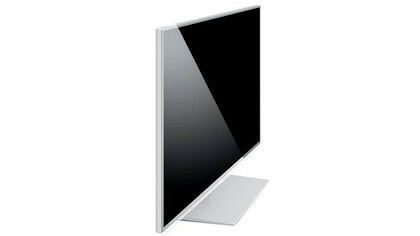 Especially edge LED TVs with really skinny frames, like this one. Before we move on from the Panasonic TX-L42E6B’s contrast performance, it’s worth adding that this TV actually produces better black levels than Panasonic’s step-up ET60 models, including the TX-L47ET60. The reason for this, we suspect, is that the ET60 series uses IPS panels rather than the VA ones used in the Panasonic TX-L42E6B, and IPS models have consistently struggled to rival VA technology when it comes to black level response. The Panasonic TX-L42E6B’s HD pictures are reasonably sharp, too. Not as sharp, it has to be said, as those of one or two rivals – most notably the two big Korean brands, Samsung and LG. However, Panasonic’s approach to sharpness is arguably more natural, avoiding the rather noisy appearance some HD images display using the Korean brands’ picture presets. This sensible rather than explosive approach to sharpness is evident with standard definition pictures, too. Such content is certainly made to look more detailed in its ‘transfer’ to the Panasonic TX-L42E6B’s native Full HD pixel count, but only so far as it’s possible to add detail without exaggerating or contributing to the amount of noise the resulting upscaled images contain. Standard definition viewing does highlight a small problem we’d slightly noticed with HD: a little loss of resolution over moving objects. Also, colours with standard definition pictures look a little less well balanced and natural than they do with HD footage. But both these problems are common in the LCD world, and generally appear to a stronger degree on rival models at the Panasonic TX-L42E6B’s price point. One final negative is that the Panasonic TX-L42E6B loses colour and contrast if viewed from an angle of more than around 35 degrees. 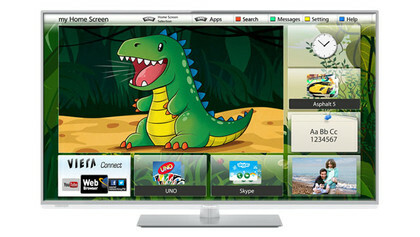 This is a universal problem with LCD TVs that use the normal VA panel design, so if your room layout routinely requires members of your family to have to watch from a wide angle, you might be better off with Panasonic’s ET60 series, which uses IPS panel designs to deliver a wider viewing angle. Though as discussed earlier, the Panasonic TX-L47ET60 struggles to deliver as much black level depth as the Panasonic TX-L42E6B. The various small problems described over the past few paragraphs could potentially be avoided if you spend more on a TV. 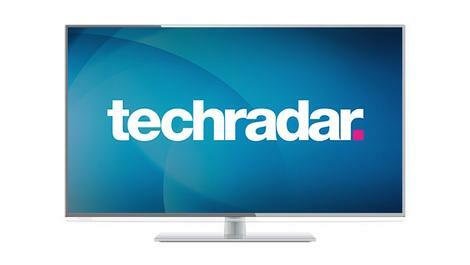 But for a mid-range 42-inch TV none of the Panasonic TX-L42E6B’s flaws can remotely be considered a deal breaker. In fact, the good points outweigh the bad sufficiently strongly to leave the Panasonic TX-L42E6B’s pictures looking excellent for the TV’s money. The Panasonic TX-L42E6B’s image traits, size and price make it a potentially tantalising gaming monitor. So it’s a relief to find it only suffering with around 37ms of input lag on average. This certainly isn’t the lowest figure we’ve recorded, but it does fall beneath the critical 40ms level where we feel a TV could start to significantly reduce your gaming performance. Thanks to its new My Home Screen interface, the Panasonic TX-L42E6B is the easiest-to-use smart TV we’ve tested to date. The multiple home screen approach provides a highly visual and straightforward way to find and access the huge range of content sources supported. Plus Panasonic has clearly worked hard with focus groups to ensure that its new interface never becomes overwhelming or confusing. There are clear sign posts to help you figure out where to go next, the home screen layout is simple and uncluttered, and the provision of a verbal tutorial when you first install the TV – and which you can play again whenever you wish – is a great touch. Also brilliant compared with the efforts of most rivals is the latest Panasonic Viera app for Android and iOS smart devices. As well as enabling you to control your TV via your smartphone or tablet, this app enables you to use your smart device as a second screen, or to share the media on your smart device with the TV. Samsung’s smart device support, on the other hand, requires you to use two different apps for second screen and multimedia sharing. Panasonic’s simple finger-swiping mechanism for moving content between your devices is a work of genius too. Panasonic’s normal picture/sound/network adjustment menus and remote control are rather more standard in their presentation. But while they’re not especially glamorous or innovative, they get the job done well enough for the most part. The only aggravation is that inputting text – into search engines or the built-in web browser – via the standard remote control is a real chore. Overall, though, the Panasonic TX-L42E6B is a triumph of usability considering how many features and content sources it’s putting at your fingertips. We know what you’re thinking: a TV as reasonably priced and super-slim as the Panasonic TX-L42E6B can’t possibly produce any sound worthy of the name. But actually, even if you feed it a full-tilt action scene, the Panasonic TX-L42E6B has a decent stab at reproducing it, courtesy of a surprisingly open-sounding mid-range and some well-rounded trebles that don’t get too harsh when the going gets tough. Predictably there’s no great amount of bass to provide a counterpoint to the treble detailing, but the mid-range is just about powerful and expansive enough to create at least the illusion of bass while also avoiding distortion. There are two sides to the Panasonic TX-L42E6B’s value story. On the one hand, the amount of picture quality the TV produces makes the £800 (around US$1,227/AU$1,182) asking price look attractive. On the other hand, it can’t be ignored that Samsung and LG both offer respectably-performing 40-42-inch TVs for the same money or even slightly less that also give you 3D playback. First, the bad news: The Panasonic TX-L42E6B doesn’t deliver any 3D support. However, 3D remains a relatively niche interest in the UK, so if you’re one of the many people for whom 3D isn’t a big deal, the Panasonic TX-L42E6B has plenty of other things going for it. 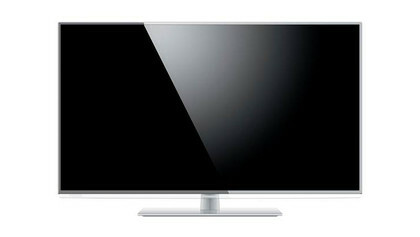 For starters, it’s a seriously good-looking TV for a mid-range model, with a super-slim frame and slinky silver finish. It’s well geared up for multimedia functionality too, thanks to its playback of music, photo and video files from either USB devices or networked DLNA PCs, and it can also go online with Panasonic’s Viera Connect platform. All the Panasonic TX-L42E6B’s many content sources can be accessed, meanwhile, through Panasonic’s excellent new My Home Screen interface, and the TV’s picture quality is mostly excellent, with rich colours, impressive contrast and well-judged detailing and sharpness. You could get crisper motion processing if you spent a bit more, and it would be nice if Panasonic got round to adding a few more video services to its Viera Connect platform. Overall, though, the Panasonic TX-L42E6B remains a seriously attractive proposition for the £800 (around US$1,227/AU$1,182) price. Its ‘barely there’ design is a sight for sore eyes, its multimedia support is mostly strong, its My Home Screen interface is terrific, and its picture quality is consistently good – even during the sort of dark scenes that often catch mid-range LCD TVs out. There’s a little resolution loss over motion, the online platform would benefit from a few more video services, and there’s no 3D playback even though some rival TVs at the same price point do offer 3D support. It’s a pity the Panasonic TX-L42E6B doesn’t support 3D when some similarly priced rivals do, and it would be great if Panasonic managed to add a few more video services to its online TV offerings. That’s where the bad news ends, though, because in terms of its design, its brilliantly friendly and well-organised interface and best of all its mostly excellent picture quality, the Panasonic TX-L42E6B is for our money the most all-round attractive LCD TV Panasonic has ever made. There are two main rivals worth thinking about as alternatives to the Panasonic TX-L42E6B. The most persuasive one of these would be the Samsung UE40ES6800. 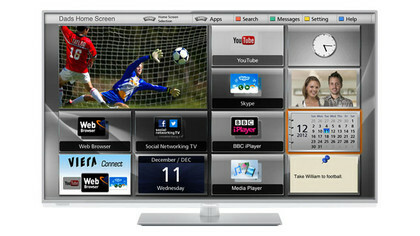 This is a 2012 TV rather than one of Samsung’s brand new models, but it still delivers a startlingly wide-ranging online service, an attractive interface, a design that’s as attractive in its own way as Panasonic’s, strong picture quality and something the Panasonic TX-L42E6B doesn’t have: active 3D playback. However, the Panasonic is overall the better picture performer, especially where dark scenes are concerned. 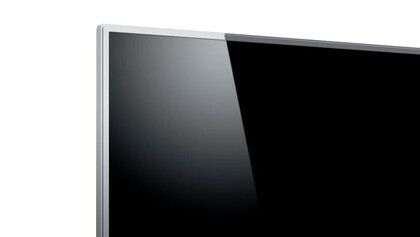 LG’s 42LM760T, meanwhile, is also a 2012 TV, not a brand new one. But it’s even more attractively designed than the Panasonic, and delivers pictures with formidable colour punch and sharpness. It also supports 3D, this time of the passive variety, and provides a hugely expansive online service. The LG’s picture quality is ultimately not as satisfying as the Panasonic’s, though, thanks to it suffering with some quite aggressive backlight inconsistencies.